Photo by the talented Mr. Chris Hornbecker. This is gorgeous - thanks for posting it! Some making-of shots by Mr. Rayburn. Trick was painting it sectionally so people could always make it to their offices. It intersects 5 offices besides mine. And here's a page on the source of the design. It shocks a lot of people to learn it was designed more than 800 years ago. It's so modern looking. The other night fourteen artists convened at my studio to discuss a possible show this summer. One of the artists was Patrick Long. He told me about missing something or other because of attending a fortieth-birthday party. That's like the new 21, I said. You have til then before you have to begin to figure it out. "Yeah, by then you ought to know all the corners," Patrick said, gesturing around the room. Wonderful expression. 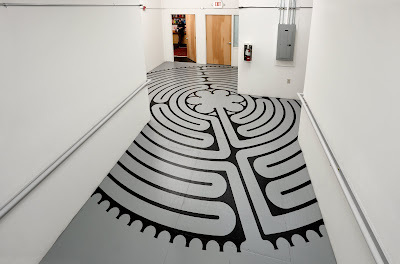 It made me think of the labyrinth, how you spend time meandering through all four quadrants before hitting the center. Makes me wonder what "the four quadrants" is metaphoric of? Our different aspects/phases/poles? Different roads we've tested?